You'll be surprised at the quality of this apartment for the price. Beautifully appointed and tastefully decorated throughout. Featuring a spa bath in the ensuite, private balcony, fully equipped kitchen with Blanco appliances and laundry facilities. Why not take advantage of this great rate and stretch out your stay. Relax and rejuvenate in this beautifully appointed and tastefully decorated apartment. Featuring a spa bath in the ensuite, private balcony, fully equipped kitchen with Blanco appliances and laundry facilities. Beautifully appointed and tastefully decorated throughout. Featuring a spa bath in the ensuite, private balcony, fully equipped kitchen with Blanco appliances and laundry facilities. A great rate and even better apartment. This beautifully appointed apartment with 2 bathrooms ( spa bath in the master ensuite) and a balcony off each bedroom represents excellent value for real quality. Not only is the apartment tastefully decorated throughout but also has lovely views of the fabulous Broadwater. Beautifully appointed apartment with 2 bathrooms ( spa bath in the master ensuite) and a balcony off each bedroom. Tastefully decorated throughout with lovely views of the fabulous Broadwater. This well appointed apartment features: balconies off both bedrooms, spacious bedrooms with a spa bath in the master ensuite and a walk in shower off the 2nd bedroom. Fully equipped functional kitchen with dishwasher and quality Blanco appliances. Add to this lovely water views and you're sure to enjoy your stay on the Gold Coast. Sit back and soak up the lovely views over the Broadwater from this lovely top floor apartment. Tastefully decorated and beautifully appointed throughout with beautiful makes this apartment something special. Relax in comfort and soak up the spectacular views of the Broadwater and Pacific Ocean. Each bedroom has a private balcony and bathroom with the master ensuite fitted with a spa bath. Tastefully decorated and furnished throughout means you can really relax in style. 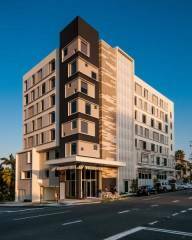 Welcome to Aqualine Holiday Apartments your ideal Gold Coast Serviced Apartment Complex on the shores of the sparkling Broadwater in Southport. This luxury Southport serviced apartment complex is close to the action but not too close. 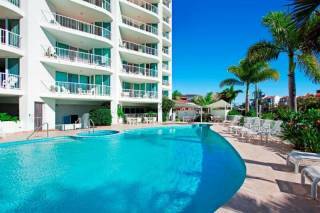 Aqualine Apartments is perfectly located for you to take advantage of all that the Gold Coast has to offer. 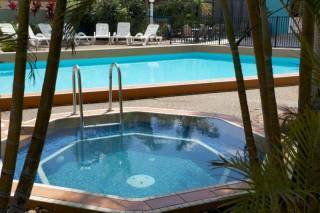 Relax by the pool and spa, walk to Australia Fair, restaurants and Southport CBD. The Broadwater Parklands with sandy beaches and protected swimming is just across the road and all the theme parks are within 20 mins. 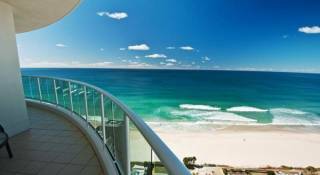 Surfers Paradise is a mere 5 minutes away. With public transport very close by, you can access everything without the need for a car. The location is perfect and so are the apartments. Beautifully appointed, self-contained holiday apartments with views of the Broadwater, the Gold Coast Hinterland or pool area at a price that will surprise you. DEPOSIT, CONFIRMATION and FINAL PAYMENT * A booking that has not been confirmed by a deposit being paid is not guaranteed * A deposit of 50% of the total tariff will confirm a booking * The balance of the tariff is payable upon arrival. We do not Accept American Express credit cards. CANCELLATION POLICY A full refund (less an administration fee of $30) will be allowed for bookings cancelled 14 days or more prior to arrival. * For bookings cancelled within the 14 days or short notice bookings (ie: within 7 days), a refund will only be given if the original booking period is relet. * An administration fee of $30 will be deducted from all cancelled bookings * No refunds will be given for early departures.